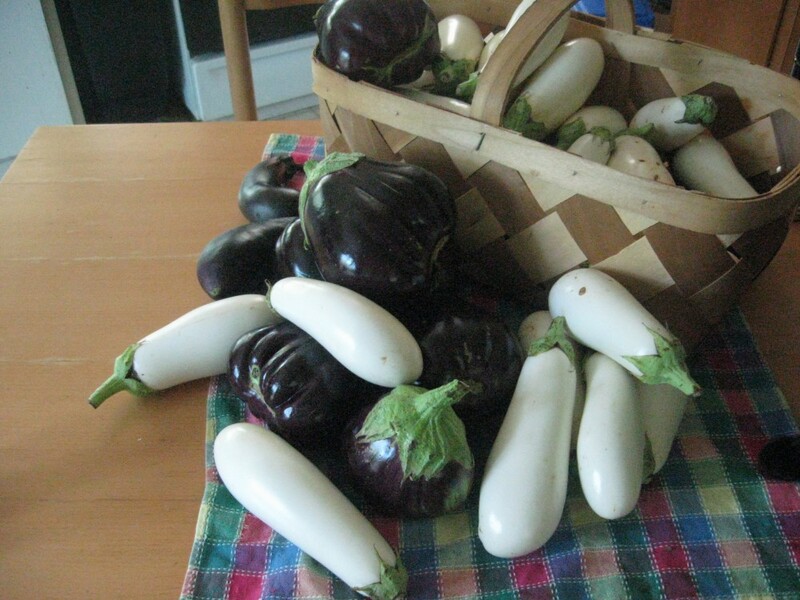 Eggplant is a lovely vegetable from the blooms to the fruit. What’s not to love about this glossy purple vegetable, especially from an artistic point of view? Beautiful color, highlights and shadows…. 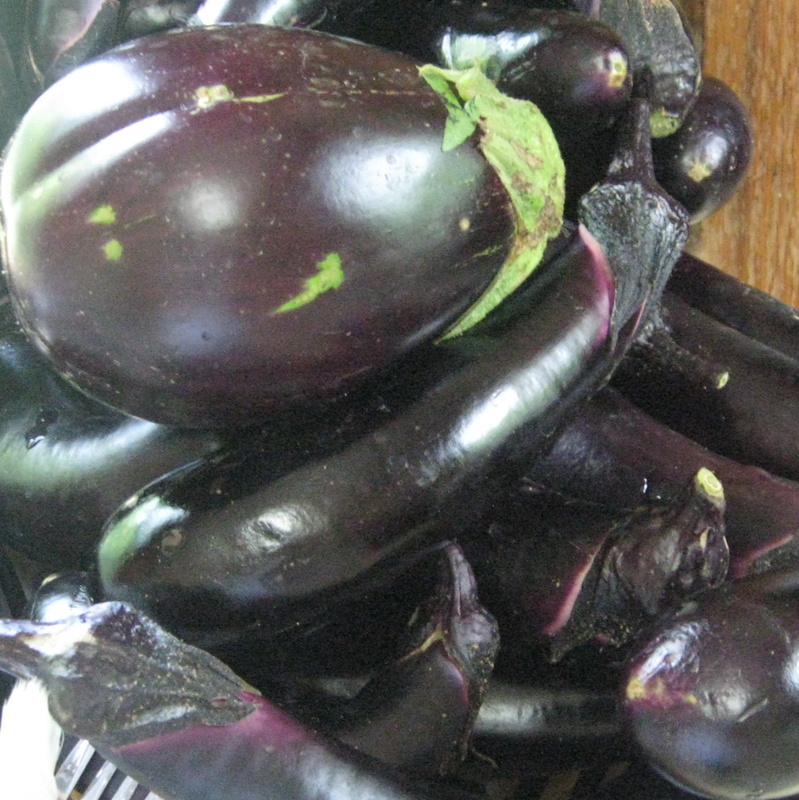 From a cook’s standpoint, at the farmers’ market I hear lots of “What do I do with eggplant?” questions. This seems to be another vegetable that needs to be looked up in a vegetable cookbook to get some basic information. I’d recommend checking out The Victory Garden Cookbook at the library if you don’t want to own it. The author is Marian Morash. I’m going to try to condense some information from various sources here to give you a bit better idea about what eggplant is and what you can do with eggplant. For any of you who might want to think about growing your own next summer, keep in mind that it’s a hot-weather plant. The nighttime temperatures need to be about 55 ° F before you put the plants out in the garden; otherwise they just kind of sit there and never do anything–even after the temperatures warm up. So don’t rush it–wait until it’s warm enough. Then you’ll have a plant that is very productive (if you keep harvesting the fruits). Come peak season, you’ll find eggplant a bit like zucchini…you will have an abundant (maybe even excessive) supply of this lovely stuff. Maybe you neighbors would like some…especially if you can tell them some things to do with it when you give it to them. one pound of cubed, peeled eggplant is about 4 cups. for 1 cup of cooked, cubed eggplant you’ll need about 6 cups of raw, cubed eggplant. for 4 servings, you’ll need about 1-1/2 pounds of eggplant. Now for choosing your eggplant: If you’re harvesting your own, size is not a good indicator of maturity–big is not necessarily better. Older eggplants can become bitter, with many seeds, and skins will be tough. First, look for glossy skin. Then lightly press on the fruit. If it’s hard, the eggplant is not ready. If the flesh presses down, and bounces back–it’s ready. Flesh of a too-old eggplant will press down very easily and will keep the depression from your pressure. Eggplants that you buy should have the “cap” and part of the stem on them. Eggplants are easily bruised so handle with care–when checking for maturity be gentle. Eggplants also are not “fond” of refrigeration; best storage temperature is about 50 ° F. Stored colder than that, the eggplant will rapidly develop soft brown spots (rotting) and will become bitter. Plan to cook your eggplant as soon as possible after purchase or harvest and store in a plastic bag with a damp paper towel, at room temperature. One of the down sides of cooking eggplant is that it’s a bit like a sponge–it can absorb large quantities of oil–which most of us don’t want in our diet because of the calories (at least). A properly harvested eggplant does not need salting in order to remove bitterness. Salting and draining, however, removes moisture from the eggplant. Traditional salting uses about 1-1/2 to 2 teaspoons salt per pound of eggplant. Let stand for 30 to 60 minutes. Then press between paper towels to get more moisture out and compress the eggplant so that it’s not so porous or “spongy”. You can also get help from the microwave: add the salt 1/2 teaspoon per pound, place on paper towels sprayed with nonstick spray, and cook on high power for about 10 minutes until it feels dry and is slightly shriveled. Press to compress the eggplant so that it’s dense, and doesn’t absorb oil. Proceed with sautéing, and it will not absorb nearly so much oil; you should be able to sauté a pound of eggplant with about 1 tablespoon of oil. (I love this method–I have been able to sauté a pound of eggplant in less than a tablespoon of oil.) See post on Caponata! This will work with sliced eggplant as well as cubed. I’d recommend doing this instead of the traditional salting, but the pressure compressing the eggplant is important. There are other things to do with eggplant than make eggplant parmesan but that seems to be a dish that everyone has heard of. Even if you’re going to make eggplant parmesan, I recommend using one of the procedures for removing moisture and compressing this vegetable. If you’re going to broil or grill (a favorite of mine) you won’t need to do the salting or compressing–just brush the slices, of halves of the oriental-type eggplant with olive oil, sprinkle on some salt and pepper and grill/griddle/broil until tender. There’s a wonderful Middle Eastern dip to make using eggplant too: baba ghanoush (many alternative spellings which I’m not going to include here). This usually starts with a whole globe eggplant baked or grilled whole before being mashed with extra-virgin olive oil and seasonings. Another popular eggplant dish which you may encounter in restaurants is Iman Bayidi–eggplant sautéed and braised with onions, garlic, and tomatoes. Ratatouille is a popular Provençal dish which uses eggplants. Baking or sautéing is often a preliminary step in eggplant dishes, but you can serve it just like that with a squeeze of lemon juice, or one of many toppings. When you’re searching for eggplant recipes, try looking at Mediterranean (Italian, Greek, southern France), Chinese, Japanese, Middle Eastern cuisines as this vegetable is frequently used in these. Just some thoughts on where to go to find things to do with eggplant now that you know how to buy it and some of the basic techniques for cooking it.